There’s a reason MMORPG players use the term “trash" to describe the stuff that leads up to raid bosses: it’s missing all the great rewards, and it’s almost always lame. It’s junk, in other words, junk that pads the time between the good parts. Red Zebra Games clearly knows the score, because Raid Leader [99¢] skips right past the trash to bring us nothing but the good stuff—intense, white-knuckled battles. As we pointed out in our preview, the big picture will look familiar to Battleheart [$2.99] fans. But it’s the little details that get this recovering World of Warcraft addict’s heart a-fluttering. There was a time when damage number spam, health bars and massively telegraphed attacks were my bread and butter, and boy do they come out in force here. Before I get your hopes up, though, let me be clear. 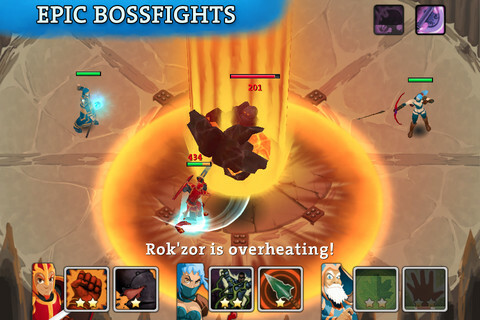 This isn’t the next Battleheart, and it’s not raiding in World of Warcraft. It’s far, far simpler than either. If you’re looking for a deeply strategic RTS-RPG, this might be a bit casual for your tastes, but it’s a potent combo for those of us nursing fond memories of raiding. Raid Leader lacks Battleheart’s big list of classes, levels and loot. Instead it has bosses, and the three things any proper team needs to defeat them: a tank, a DPS class, and a healer (in the forms of the Knight, Hunter and Priest). Each of them has a bevy of skills to unlock and choose from, and choose you must, because each character can only bring two skills into battle. You might want to deal damage, snare and buff with one character, but you have to pare that down to the skills you really need. That’s half the game’s strategy right there. The other half is the battles themselves. There are fifteen levels in total, with 2 arenas, 8 original bosses and a powered-up heroic version of all but the last. These have minions, lasers, death zones and many other familiar tricks, requiring priority targeting, clever positioning and quick reflexes. Lest you think I’m being irresponsible with my WoW comparisons, by the way, one of those bosses is nearly a one-to-one clone of Karsh Steelbender from the most recent expansion. Not that I mind. It just feels a little too much like coming home, if you know what I mean. Your survival depends on two things: how well you’ve chosen and upgraded your skills, and how well you can pay attention and perform. It also helps to have a basic understanding of MMORPG-style battles. You’ll have an easier time if you already know that the tank should keep the enemies’ backs to his team, or when to toss a heal-over-time and switch targets. Admittedly, though, knowing too many tricks takes a little fun out of figuring out the right strategies for each fight, especially when kiting works so effectively. Because of this, the game sometimes fails to straddle the line between too easy and too hard. 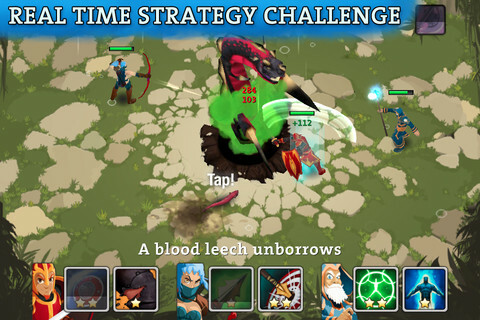 Executing a strategy is often fairly simple, because the bosses never have more than three or four plainly timed and well-telegraphed abilities. You’ll never have serious trouble figuring out how to handle an encounter when anything tricky is explained on screen. You’ll still run into plenty of difficulty, though. Two things will conspire to stop you no matter how well you can plan. The first is the somewhat-awkward touch controls. 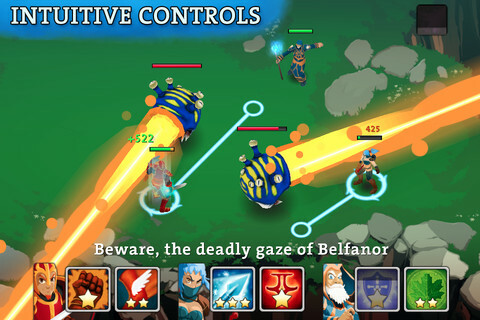 Like in Battleheart, you drag one hero to another to heal or attack, and drag your heroes around the screen to move them. Because those two actions are so similar, you may occasionally find the game mixing up your intent. Worse, though, is the way the controls sometimes lead to deaths-by-Notification-Center. Those probably can’t be helped, but that doesn’t keep them from being frustrating. The second big roadblock is the enrage timer most bosses sport. This isn’t a problem, it’s a classic MMORPG mechanic. Three or four minutes into a fight, the boss becomes immensely more powerful. This isn’t designed to kill you instantly, but it does keep you from flinging yourself at a boss for ages if you’re not powerful enough to defeat it. In Raid Leader, you’re not going to run down the clock because you haven’t leveled enough or hit the right gear level. Instead, it’s your skills that can fall behind. 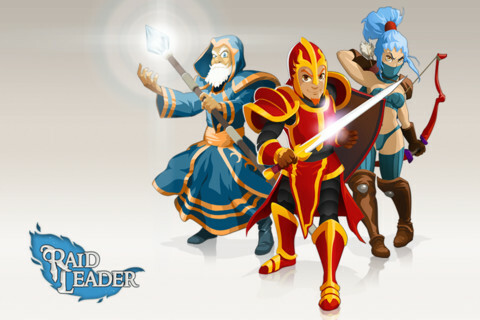 The three classes each get eight or nine skills to play with. These include a healthy mix of class-appropriate heals, attacks, buffs, debuffs and so on. You can pay out the coins you earn from defeating bosses to upgrade them up to four times each. If you’re a better player than I am you might be able to get by with nothing more than the coins you earn from each boss. I rather doubt it, though. It gets seriously tough to pump out enough damage to beat the enrage even when you’re doing well. If you hit a wall and decide you need more coins, you have two options: grind or pay. It’s kind of a lame choice. Grinding is actually fun in Raid Leader, but it’s hard to turn down the comparatively massive number of coins you can get by putting down an extra dollar or two. If you do, you can earn a decent rate in two arenas fighting waves of minions, or you can replay completed boss fights. You can earn Game Center achievements and leaderboard rank for beating bosses quickly, so this isn’t a bad way to go. I just wish there was more of everything. I want a reason to pull out more skills and level them higher. I’d dread putting hours into WoW at this point, but the few brief hours I put into Raid Leader left me craving a lot more. That’s not a bad thing, assuming there’s more to come. While we’re talking updates, Red Zebra, could you work out the spelling errors and put some clothes on the poor Hunter? She’s literally fighting in a bikini. Not even a chainmail bikini, just a few flimsy scraps of nothing. Raid Leader isn’t perfect, and it’s not perfectly original. That said, it sure is fun. Any recovering raider will find plenty of great nods and familiar concepts, and anyone who’s wondered why folks make such a fuss about raiding will get a low-impact introduction. Drop by our discussion thread to let us know what you think, and point out how much you want more levels while you’re there. For me. Because even though I can quit any time, I really don’t want to quite yet.